When executing Java actions in an Oozie workflow, there are going to be cases where you want to have certain data to be passed from your action to the workflow itself, making it avalailable for use within the workflow. This can be easily achieved by adding “capture-output” element to your workflow action, which is an indicator for Oozie to capture the output of your action. Check out an example on how to do this here. The good news is, you can easily increase the maximum size of the property file, by simply adding the below into oozie-site.xml file. You could of course adjust the value to your need. 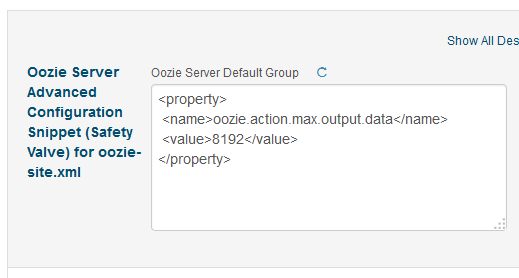 Or if you’re using Cloudera Manager, you can adjust the “Oozie Server Advanced Configuration Snippet (Safety Valve) for oozie-site.xml” in Oozie configuration. Make sure to restart your oozie instance after this configuration change.